Hairlossstudio.com is a free independently run website offering general advice and information on hair loss. The site has been built from personal experience with hair loss and hair thinning. Please note that you should always seek independent professional advice before acting upon any information read on the HairLossStudio.com website. Hair loss is a common problem, but this does not mean that it can’t be extremely upsetting for the individuals affected. The good news if you are suffering from hair loss is that there are an increasing and varied number of treatment options available for both women and men. Alopecia is the overall term used to describe hair loss but there are many different types, causes and symptoms, from female and male pattern baldness, alopecia areata and scarring alopecia to anagen effluvium and telogen effluvium. The most common form of hair loss is male pattern baldness, which affects around 50% of men by the time they reach the age of 50. 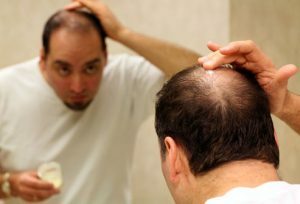 The condition usually begins in a man’s late 20s or as they enter their 30s and almost all men are experiencing some amount of hair loss as they reach the end of their 30s. For some people this is seen as a ‘normal’ part of getting older, but for others it can be an extremely distressing experience that diminishes their self-confidence and affect all aspects of their lives. 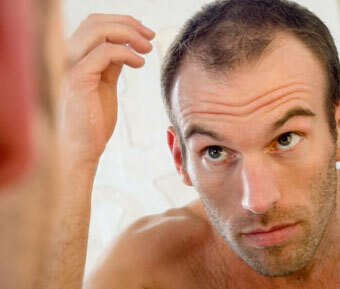 Male pattern baldness, a hereditary condition linked to over-sensitive hair follicles and a hormonal imbalance, normally starts with a receding hairline and may then by followed by hair loss at the temples and crown, leaving behind a horseshoe pattern of hair around the sides and back of the head. Pattern baldness in women normally causes the hair to thin on the top of the head and is usually most noticeable in post-menopausal women. Alopecia areata, meanwhile, is caused by immune system issues and will normally affect young adults and teenagers. This condition causes bald patches, which often regrow in time, although in some cases more serious conditions such as alopecia universalis and alopecia totalis can develop. Scarring alopecia is normally associated with other medical conditions and is caused by the destruction of hair follicles, while anagen effluvium is the term given to widespread hair loss often caused by chemotherapy and other medical treatments. Telogen effluvium refers to the widespread thinning of hair rather than to areas of specific baldness. This can be caused by a wide variety of factors, ranging from pregnancy, illness and stress to diet changes and medication. Choosing the right treatment option for you will depend on the type of alopecia you are suffering from and the reasons behind your decision to take action. If you are looking for treatment for female or male-pattern baldness to improve your appearance, for example, a hair loss solution comes in the form of minoxidil medication. There are many other options available, whether you want to stimulate hair growth or simply disguise the issue. Some of the most popular hair loss solutions include hair concealers and hair fibres, specialist shampoos and conditions, and toupees, wigs and hair systems. There is also the potential of medication known as Propecia or finasteride, or vitamin treatments to consider, or there is the option to undergo hair loss transplants and surgery to improve your appearance. Hair loss is not something that has to be endured, thanks to the wide range of solutions available. Begin your journey to renewed self-confidence by browsing our site today. Hair loss doesn’t discriminate: it affects celebrities as often as it affects the rest of us. It is an entirely natural process and is rarely symptomatic of any specific disease, but it can be distressing, damaging one’s confidence and self-esteem. This is magnified for celebrities, who are so often in the public gaze and are routinely and harshly judged on their appearance. We showcase a list of A List celebrities dealing with hair Loss here.